This custom built home with floor to ceiling two story windows, loft and large media room is located on beautiful Paradise Island. 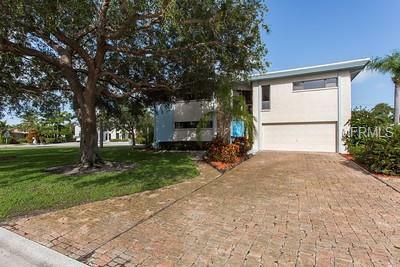 This magnificent three bedroom home is surrounded by water and breezes throughout the year. Massive 100 year old canopy trees, Chicago style brick paver driveway and back courtyard, waterfall and gazebo bring warmth and charm to this two story home. The master suite offers walk in closet, bathroom with double sinks, full tub with shower. Two other bedrooms have double closets and en suite full bathrooms. Oversize two car garage with washer and dryer, as well as a washtub. Multiple sliding glass doors lead to full length deck overlooking courtyard with large trees and New Orleans soft lighting. This community is a walk away from famous Gulf beaches, Yacht Club, public golf and tennis courts. The center of Treasure Island has great restaurants, banking, Publix shopping and police and fire departments. A remarkable luxury value, so treat yourself to something special!